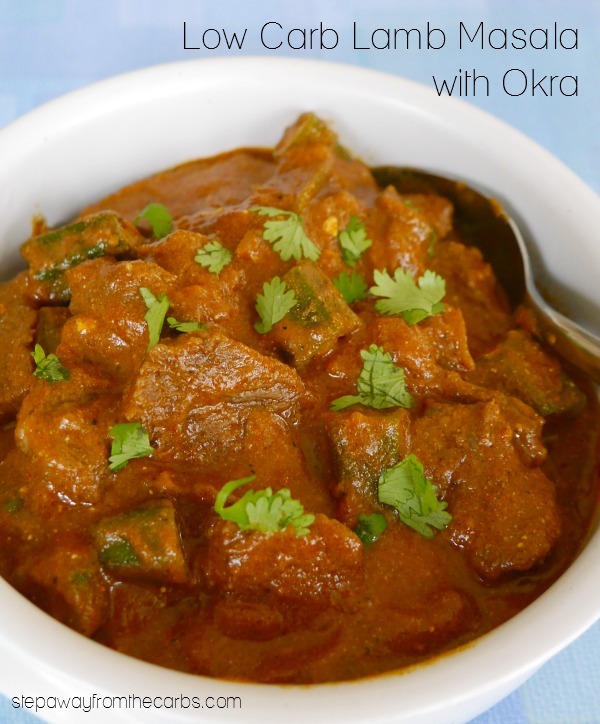 This lamb masala has an amazing savory flavor and the okra is the perfect low carb vegetable for this entree recipe! 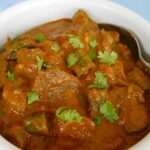 This Indian curry dish can really be made with any meat. 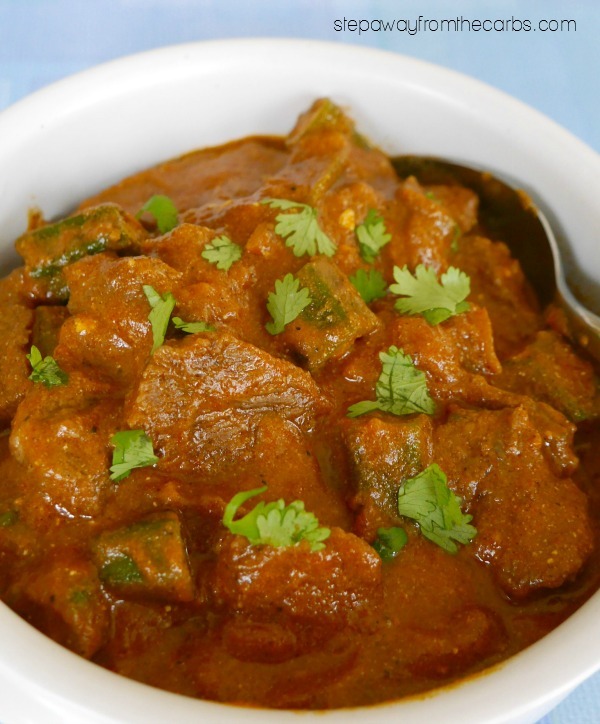 “Masala Gosht” translates roughly to Meat Curry with Roasted Spices. It takes a little while to make but the deep intense savory flavor is worth it. 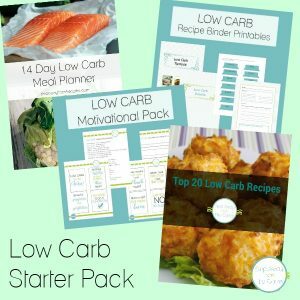 I used lamb shoulder for this recipe – it’s relatively cheap for lamb and has great flavor when cooked this way. Heat some oil in a large pan. Add garam masala and cook for a few minutes. It will start to smell absolutely fantastic! While that’s cooking, prep the lamb. Remove the bones and do some general trimming. Then chop up the rest. 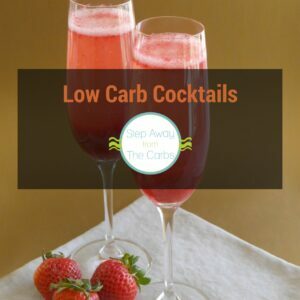 Add chopped onion (I use ready-chopped straight from the freezer – shhhh don’t tell anyone!) and the lamb to the pan. Cook for five minutes or so until the onion is softening and the lamb is browned all over. Add tomato sauce, water, garlic paste, and ginger paste. Yes, the pastes are more time savers! Oh and I use an 8oz can of tomato sauce, then fill the can with water and add that to the pan. No need to dirty a measuring jug! Bring to the boil, then down to a simmer. Cover the pan and leave for 35-40 minutes over a low-medium heat. The sauce will thicken and reduce. Add the okra and some Greek yogurt. 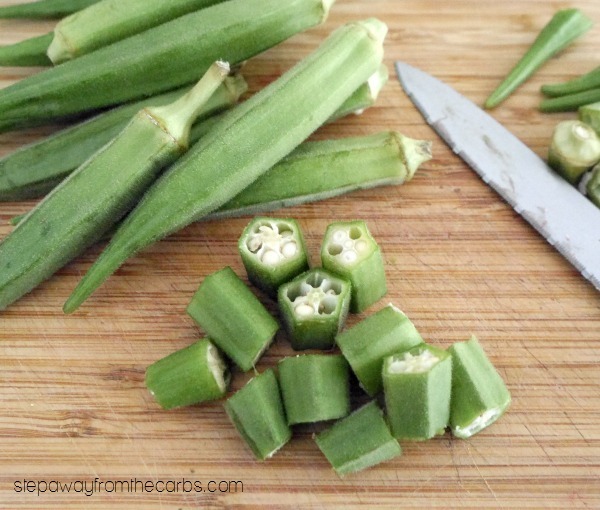 Cook for five minute or until the okra is tender. Test for seasoning – it may need some added salt but that should be all. Transfer the curry to a serving dish and sprinkle over some chopped fresh cilantro. 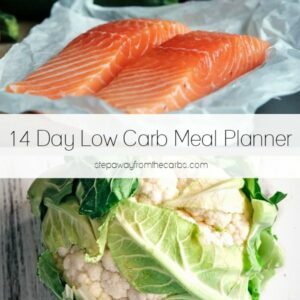 Serve with Cardamom Cauliflower Rice and/or low carb Naan Bread! Heat the oil in a large pan then add the garam masala. Cook for 2-3 minutes until fragrant. Add the onion and lamb. Cook until the onion has softened and the meat has browned. Add the tomato sauce, water, garlic and ginger. Bring to a boil, then reduce to a simmer. Cover and cook for 35-40 minutes until the sauce has thickened and reduced. Add the okra and yogurt. Cook for 4-5 minutes until the okra is tender. Check for seasoning, add salt if necessary. 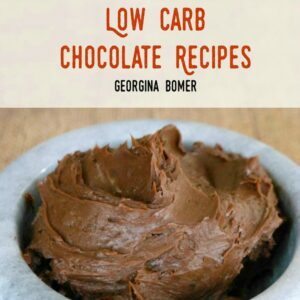 I have just bought the ingredients to make this – do you think it would work in the slow cooker if I browned the meat first? Absolutely! Let me know how it works out! Can you give some indication of weight on those lamb shoulders? I don’t see anything in my store called “lamb shoulder,” but I can get various cuts of lamb meat. Thanks. From memory I’d estimate they were about 8-10 oz each. 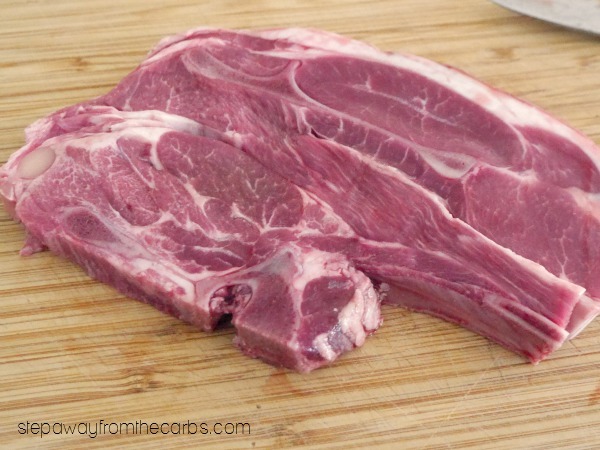 What cuts of lamb can you get? You don’t wash or ad lemon to the okra? No – I didn’t do either of these things!